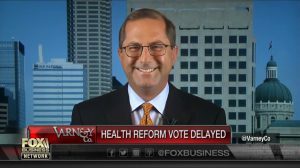 Today President Donald Trump nominated Alex Azar to be the next U.S. Secretary of Health and Human Services (HHS). Azar served for five years as president of Lilly USA, LLC, the largest affiliate of global biopharmaceutical leader Eli Lilly and Company. President of Public Citizen, Weissman said today: “Just weeks after denouncing ‘out-of-control’ prescription prices, President Donald Trump shows he doesn’t mean it by nominating a former pharmaceutical company executive to run the U.S. Department of Health and Human Services. If Alex Azar’s nomination is confirmed, then Big Pharma’s coup d’etat in the health care sphere will be virtually complete. “In his public statements, Alex Azar has made clear that he is opposed to measures to restrain prescription companies’ profiteering and limit improper marketing, while favoring weaker safety approval standards. “Americans understand, passionately, that price gouging leads to rationing of care. It is unethical and must end. Even President Trump says so. But it is highly unlikely that a pharmaceutical company executive who has made passionate arguments against price restraints is going to advance real reform. Much more likely is that he serves as the instrument by which Big Pharma aims to defend its monopolies and unaffordable prices.